TONIGHT! The Richter Uzur Duo plays a whimsical mashed-up blend of classical, world and rock music. 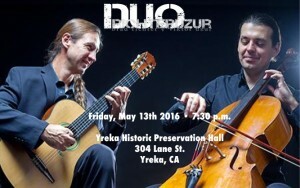 The Red Scarf Society for the Performing Arts is offering the community a chance to enjoy this unique experience at 7:30 p.m. on Friday, May 13, at Yreka Historic Preservation Hall, 304 Lane St., in Yreka. Tickets are $25 (or two for $40) for adults, and $5 for students.